With more than 130 million members (and growing at a rate of 150,000 new members each day), MySpace.com is undeniably a cultural phenomenon. And it's not just for teens anymore: According to digital media measurement firm comScore Media Metrix, users aged 25 and older comprise 68 percent of MySpace visitors each month. Twelve percent of MySpace users are in the 12 to 17 age range; 18 percent are between ages 18 and 24. In short: Not only is a whole new generation of teenagers coming of age on MySpace, but adolescents are also interacting with individuals of all ages via the Internet--for better or worse. 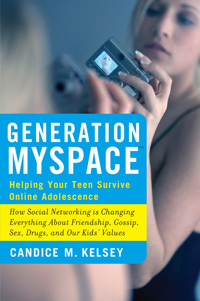 In Generation MySpace: Helping Your Teen Survive Online Adolescence (Marlowe & Company, April 2007), Candice Kelsey draws from personal interviews with hundreds of teens, experts, and parents, to help parents and teachers alike navigate the social networking landscape, and assess what parents should and shouldn't be worried about when it comes to social networking technology. A Los Angeles high school teacher for nine years, Kelsey has witnessed firsthand the dangers of sites like MySpace, where, she warns, "Threats against teachers, discrimination against other students, intimidation, and conspiracy to commit acts of school violence are commonplace." Whether MySpace is considered bane or boon, Kelsey's book certainly will be of interest to university administrators, for whom social networking is becoming a top-of-mind issue. Last fall at the University of California-Berkeley, in light of students' generally heavy use of sites and directories like Facebook, incoming freshmen were required to complete an orientation promoting safe practices--before they were allowed to access the campus network. Moreover, college administrators know that today's employers increasingly are using MySpace to investigate job applicants. Students posting photos from a raucous college party now need to think twice about the potential damage they could be doing to their careers. Yet, MySpace is here to stay. To capitalize on today's generation of social networkers, forward-looking institutions like Saint Mary's College (CA), MIT, the University of Florida, and Washington University in St. Louis (MO) are utilizing an array of social networking tools to improve communication between students and faculty, enhance instruction, connect with alumni, and even attract prospective students (see CT January 2007, "Social Revolution").